Penny's Points: Is that sore? 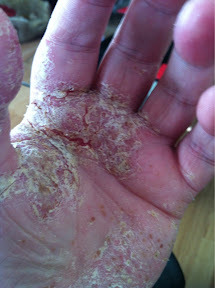 This is my left hand, my right hand and feet and the other parts of my body affected by Psoriasis are not quite as bad as this right this moment although they have been and will be again. Notice the swelling? That's the Psoriatic arthritis that is in practically every joint in my body and means movement is hard and painful. This hand is useless now as are several of my joints and this obviously affects movement etc. Twice this past month I have been questioned regarding my disabilities, Once outside of my own home as I was getting into the car that is parked in a disabled bay and again sitting in the car outside the town centre waiting for my mum to finish shopping. Why? Why am I suddenly being asked to prove again and again that i am entitled to the disabled bay,the blue badge and the fact that I no longer work? Why did I have such a fight with all the stress that entailed before I was placed in the support group of the ESA benefit? Why am I going to have to do the fighting all over again for DLA benefits next year? And why am I going to have to prove this continually year after year after year When this is a progressive disease, I am not going to ever get better! What kind of person/people/society allows and in some cases encourages the bullying of sick/disabled? Are my neighbours checking my blinds every morning? And if they are still closed at 9am do they label me a scrounger? Do they even stop to think I may have spent a restless night in pain? Have they any idea how tired this condition makes me feel? Do they know anything about me at all before they pass judgement? Why should they? What right does my neighbour, the woman down the road or the man who spoke to me outside my own home have to question me? Because this government has painted this picture of us all living the life of Riley, sitting in front of our flat screen televisions once we have bothered to roll out of bed, drinking, taking drugs and defrauding the rest of society by spending your taxes on our lazy feckless selves. We lost not one but two wages when I became too ill to work 3 years ago, after struggling alone for a year my husband had to become my carer, look at my hands and bear in mind my mobility problems etc and it is clear I can not cook for us, clean for us, shop and personal care as in washing and dressing etc also now requires his help, can you imagine getting soap, shampoo, cleaning materials on my hands? He gets £53 a week for his caring role! I get ESA & DLA at the moment although I am in constant fear of one/both being stopped at any time when I next get assessed and judged 'fit for work' maybe? Life of Riley? Does it sound that way to you? Would you like to change places with me? Do you think I have it easy? I am not writing this for sympathy and for goodness sake please don't pity me, I am writing it because I am disgusted at some of the comments being left on some articles/blogs and some of the replies I have seen on twitter and Facebook, some people I consider friends have 'liked' and commented on several of the articles bashing sick/disabled/unemployed recently and it saddens me that the hateful government rhetoric is having the desired effect turning people against others and causing a split in society between the haves and the have nots. So what am I trying to prove? Nothing, I have nothing to prove to anyone, you have no right to judge me, you have no right to label me or anyone else, you don't know the circumstances. if I sit with my hands down by my side my disability is invisible to you for that moment, If I hadn't posted that picture of my hand you wouldn't have known this is what I have would you? we don't know what is wrong with people just by looking at them. Life is hard enough for lots of people right now and we can do without others making it even harder so before you judge someone to be a scrounger or benefit cheat stop and think because there but for the grace of god or a change of circumstances goes you! I notice during ATOS medicals and I presume the same will happen during PIPs points can be deducted for being noted as "clean and tidy". From that one can deduce some peoples of vision of disability is disheveled and dirty. with no sense of pride. The fact that if you’re me and have always had a face like a robbers dog and therefore would not dream of going out without makeup is not taken into account. Two wobbly poorly drawn lines of eyeliner equals “no problems caring themselves”. Take the case of the woman suffering from severe incontinence. She had to wait 40 minutes in an ATOS center before being seen by a “doctor”. She asked for the key to the toilets, the receptionist claimed not to know where the key was. The poor lady defaecated into rubber pants and attended WCA. She was then found fit for work as it was noted “Thoughout interview client at no time requested use of toilet facilities”. So because this woman didn’t LOOK disabled short of squatting in the middle of the room she had no other way of proving it. Excellent post which highlights the feelings so many of genuinely disabled people are feeling. It is hard enough living with a condition such as yours, without having to 'prove' again and again that you're not trying to claim benefits unnecessarily. It is ridiculous and a frankly inhumane way to treat people. I can understand the need to reapply after a certain time, which was always the way with IB and DLA anyway. There are conditions which may improve over time. This ridiculous continual testing, sometimes as soon as you've successfully appealed however is pointless for anyone who has an incurable and/or progressive condition. It is a complete waste of taxpayers' money, but it is all done in the name of exactly the opposite. So much easier to target those least able to fight back though isn't it? It is a stupid, disgusting and totally unfair situation, which the majority of people will never have cause to have first hand experience of. They will have no real idea of the terror that so many people are living with, from one assessment to the next.